Three of my patrons all requested Lord of the Rings style fantasy paper doll content for 2017, so Denise, Chris and Grace, this is for y’all. Now, I will confess that I find Lord of the Rings to be among the most boring books ever written. I know there are circles where this opinion would get me shot, but I can’t help it. There is so much description. I just don’t care about trees that much. Give me The Hobbit an I am a happy camper. I would far rather read it. Still, the movies are visually stunning. So, that is where my inspiration came from for today’s Lord of the Rings dress. 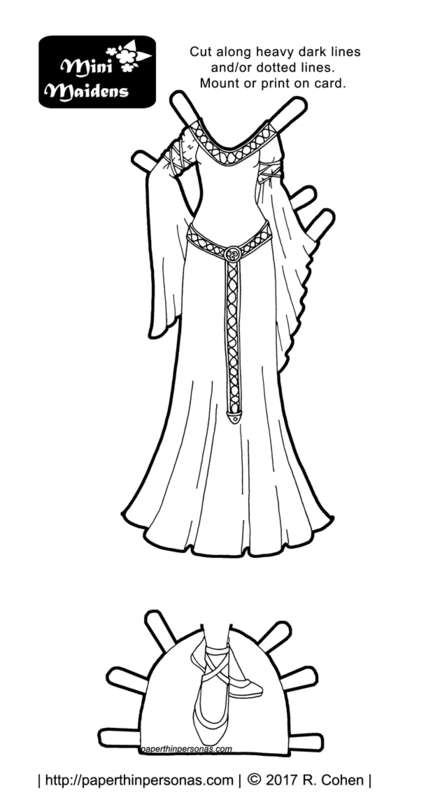 Specifically, I was thinking of Eowyn’s “White Wool” Gown. Personally, I wouldn’t color this white myself. I would go for a rich red or blue. That’s just me though. Don’t let me stifle anyone’s creative juices. Anyway, when someone says Lord of the Rings dress, I think of classic high fantasy and for me that means sleeves you could hide a small army in. A very small army, but an army none the less. Maybe a mouse army. Also, the blog has a fairly new facebook page which is pretty neat. I’m using it to show off stuff from the expansive and amazing archives of PTP. Trust me, there’s a lot of material in there. And, as always, if you love the blog, think about becoming a patron. Yup, this is a pretty classic fantasy dress – and nicely done, as usual! Do you remember the Hobbit animated movie? That was my first exposure to the Lord of the Rings. I honestly didn’t read the books til the movies came out. None of them are among my favorites. But you’re right – the movies are gorgeous!